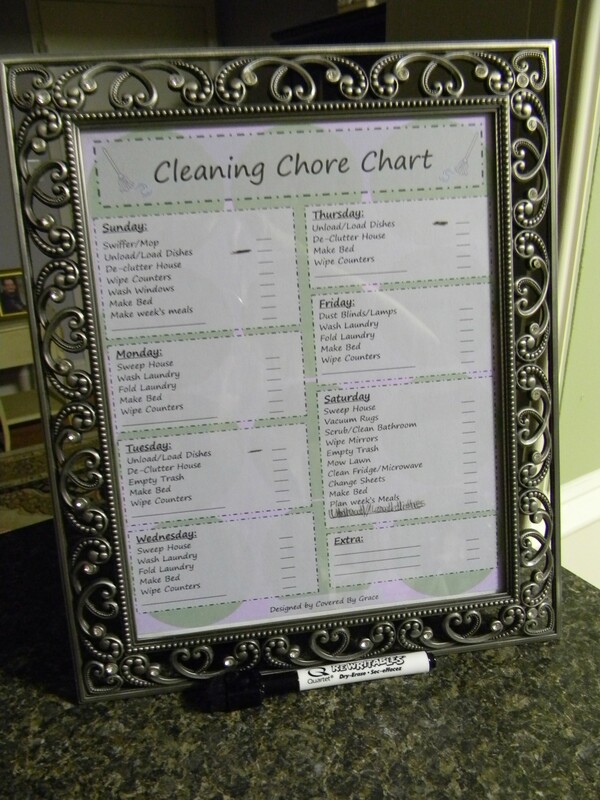 I am a high school history teacher and my husband owns a small business that I help him with…needless to say, after we got married, it became VERY evident that we needed to figure out a good way to know WHAT chores to do and WHEN to do them. While reading Real Simple Magazine, I took in some very good advice submitted by another reader- she said she would do one load of laundry a night and immediately fold and put it all away, therefore, keeping up with the chore and still being able to enjoy her weekend rather than spending hours grueling over grimy bathrooms and greasy stoves. So…I applied her logic to a chore list. 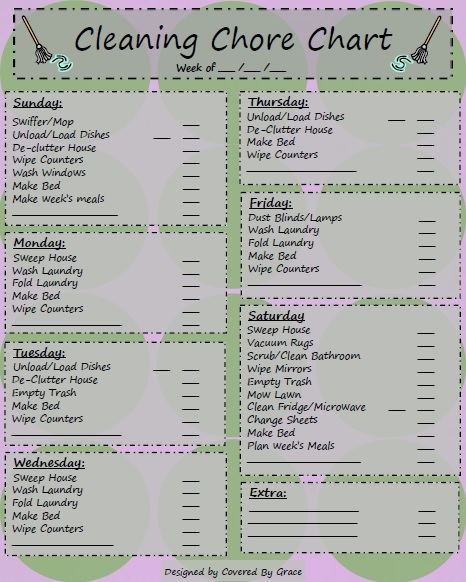 This list can be customized, since my husband and I have opposite work schedules and I’m very busy during the week (during the school year), I put a few small chores each day during the week so we wouldn’t feel overwhelmed but I’d also feel like I was getting work done, and I put more chores on the weekend. These lists help you see what you need to do each day of the week, and you mark it off with a wipey marker, as you go. Beyond that, I decided I didn’t want to print out a whole new list each week, so I made it a little prettier. 🙂 If you decide to do this, really, all you need is an 8×10 picture frame- it can be one that stands or hangs. I had a pretty one from our wedding we didn’t use, and our little chore list now stands on our breakfast bar between our kitchen and living room. As I designed it, I used colors that matched the two rooms, to bring it together. If you’d like one customized, please feel free to e-mail me at coveredbygrace122@gmail.com. Also, check out my new business Facebook page- Covered By Grace – to keep up with exciting new additions to the business, progress of baby blankets to be donated, and more. Also, I will be adding an etsy shop link here very soon, so keep your eyes peeled (ew! )…but until then, enjoy the chore list and feel productive! God bless.